The Saluki is an elegant sighthound with a strong instinct to hunt. The breed is medium-size, weighing 35 to 70 pounds and standing 58 to 71 centimetres at the withers. It can adapt to any environment as long as it is exercised daily. The Saluki is an affectionate and devoted family companion. 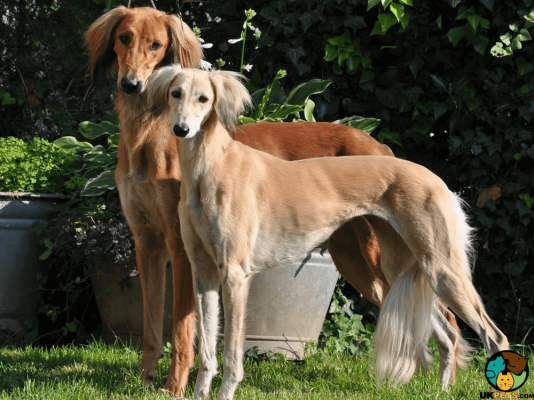 Are you planning to buy a Saluki dog? Here is a brief background of this graceful and elegant sighthound. 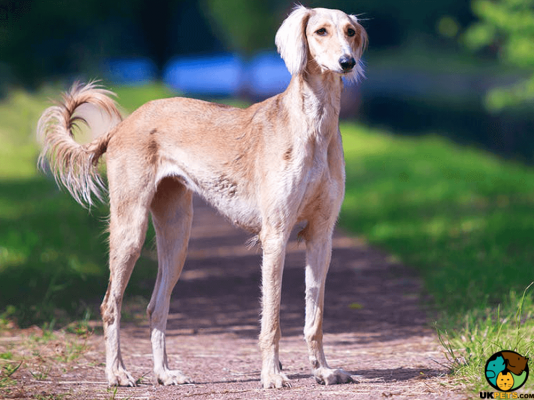 The history of the Saluki is shrouded in mystery but DNA analysis confirms that the Saluki has canine genomes of an ancient hound found in the Middle East. Images of dogs resembling the Saluki are found in archaeological sites, and in Egypt, it is said to be mummified after its death. Poets extoll Salukis for their grace and swiftness. These were hunting dogs ranked above lowly dogs and were highly-valued as fine horses or falcons. The Saluki was first introduced to Europe around the 12th century. In 1840, Salukis found their way to England. However, the breed was not popular until the early 1920s when war officers brought pet Salukis when they returned from the Arab Revolt in the Middle East. In 1923, the first breed club was established, and The Kennel Club recognised the breed that same year. 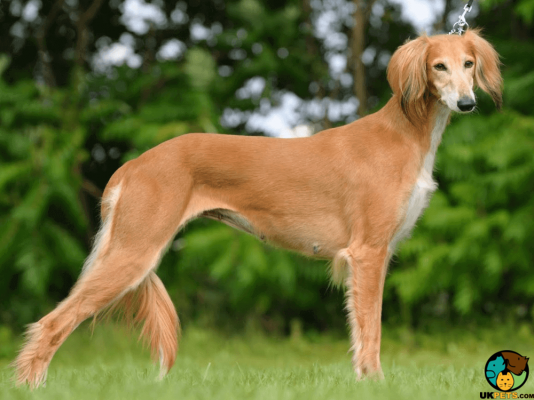 The appearance of the Saluki gives the impression of grace, elegance and athleticism. Its form is built for speed and endurance. The Saluki is a medium-size dog that should have an average weight of 35 to 70 pounds and 58 to 71 centimetres. However, females are considerably smaller. Salukis have large heads that are long and narrow, well-defined stops, black noses, and eyes that are moderately large with a dignified expression. They have ears that lie close to their cheeks, necks that are long and nicely arched, sloping shoulders and long straight front legs. The Saluki’s tail is set high when moving or alert. The breed has two coat types: rough and smooth. Rough-coated Salukis have thick coats that lie close to the body and thicker hair on their necks, thighs and tails. On the other hand, Smooth-coated Salukis have closer, hound-like coats with only a slight feathering on their thighs and tails. 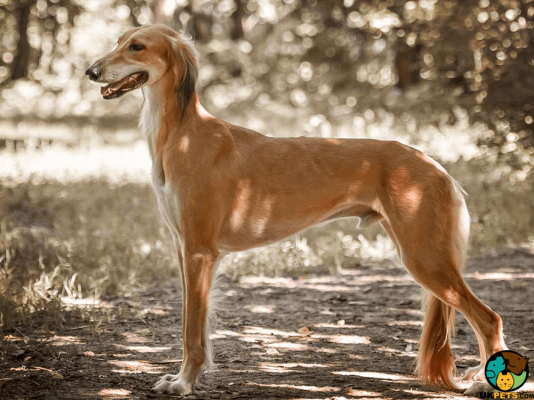 Regardless of coat types, the Saluki can wear coat colours of white, fawn, cream, grizzle and tan, black and tan, golden and tricolour (white, tan, and black). Dog grooming-wise, the Saluki is not a prolific shedder. It is a low maintenance dog breed that only requires weekly brushing to remove dead hair and maintain its natural oils. Since Salukis do not have a doggy odour, only bathe them when dirty. Other dog grooming needs include oral and nail care. Brush the dog’s teeth to avoid gum disease. Trim the nails especially when you start hearing clicking sounds. Also, clean the ears to ward off potential infections. The Saluki is devoted to its family but aloof toward strangers. This dog breed is gentle and thrives on human companionship. It forms strong bonds, which is why it is may suffer from separation anxiety. Salukis like to keep their distance from new people and as such are not natural watchdogs. It also does not help that these dogs are not barkers, like most sighthounds, since they hunt prey with stealth. However, the wariness can be corrected, and they can be taught to bark when the dog is socialised and trained at an early age. Salukis are not the ideal choice for novice dog owners. These dogs need a steady handler that is familiar with the specific needs of an extremely agile and sensitive dog. When it comes to being a family companion, the Saluki is a friendly, affectionate and devoted breed. It is also known to enjoy being around children. However, it is not suitable for homes with toddlers since it is a bit high-strung and can easily knock down small children. Any interaction must be well-supervised to avoid accidents. Salukis generally get along well with other dogs since they were originally bred to hunt in packs or with other sighthounds. However, their high prey drive prevents them from being relaxed around smaller animals. Care should be taken when a Saluki is around small pets, including cats, because it will think nothing of chasing the small animals as fair game. A typical serving for an adult Saluki is 1.75 to 2.75 cups of high-quality dry dog food daily. Deciding the right nutrition for your dog isn’t something that should be taken lightly. Several considerations go into pursuing a balanced diet the Saluki deserves, so it is best to seek advice from a vet or a canine nutritionist. For starters, below are typical calorie needs of an adult Saluki that weighs 50 pounds. Carefully examine the labels on dog food to help you make informed purchases. Make sure to buy kibbles or commercial dog food formulated for the dog’s size. Also, don’t forget to introduce fresh fruits and vegetables. The fibre in fresh whole foods will aid the dog’s digestion. Lastly, do not overfeed and make sure to limit treats to avoid bloating. When you still find it hard to decide, work with a veterinarian to design a diet plan for your dog. There are a number of reasons a dog can get sick. While the average, well-cared-for Saluki doesn’t get sick often, some health problems can still occur. These health problems include Hip Dysplasia, Persistent Pupillary Membrane, Lymphoma, Bloat, Anaesthesia Sensitivity, Hemangiosarcoma, Cardiomyopathy and Hypothyroidism. Taking necessary steps can help minimise these health issues. Talk to a veterinarian for signs and symptoms of these health conditions and never skip routine veterinary visits. How much exercise a Saluki needs will depend on several factors including age, physical health and activity level. In general, a Saluki will require at least 2 hours of daily exercise since it is an active and athletic sighthound. When the breed lacks activities and mental stimulation, expect to see destruction around the house. Salukis, or most dog breeds, quickly pick up on negative habits to curb their boredom. They will resort to excessive barking, chewing and digging. It is important to learn what pet expenses to expect before bringing a dog into the family. Do remember that the cost to own a dog is more than just the expense of food. When you decide to buy a Saluki puppy, make sure you have enough money to care for it throughout its lifespan. If you choose to purchase a purebred, you can expect to spend £400, give or take. Also consider buying pet insurance for your dog, which will cover a part of the vet expenses. The cost for pet insurance will depend on the provider, your location, the dog’s age and current health. T give you a rough estimate, a 3-year old Saluki with no prior medical history will cost around £20 a month for a basic cover and £45 for a lifetime cover. High quality dog food is a big part of taking care of a healthy dog. The typical cost of dog food is somewhere from £40 to £50 a month. Routine veterinary care is also crucial to keep your dog healthy. Going for wellness checks, including basic vet procedures (e.g. vaccinations, boosters, neutering) will cost at the least £1,000 a year. Overall, you should budget about £70 to £100 per month. However, the amount is merely an estimate. As a responsible future dog owner, make sure to do your own research. 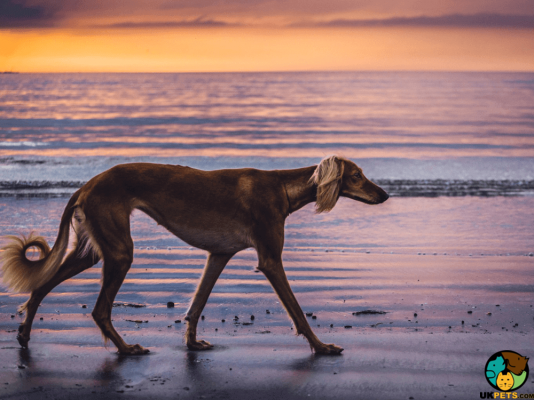 Is a Saluki Right for You? The Saluki is an elegant sighthound with a strong instinct to hunt. It is an affectionate and devoted family companion. It is low maintenance, grooming-wise, and only requires weekly brushing. Salukis give the impression of grace, elegance and athleticism. They like to keep their distance from strangers and as such, are not natural watchdogs. Introducing Jakey, A Very Loving Saluki X.